Following July, which was the best July in local history, August also saw record numbers in overall sales. August’s sales were up 24.5% overall. The number of unsold homes in inventory went down 17.7% and the supply of unsold homes in August went down 33.9%. The average sales price grew ever so slightly by 5.8%. 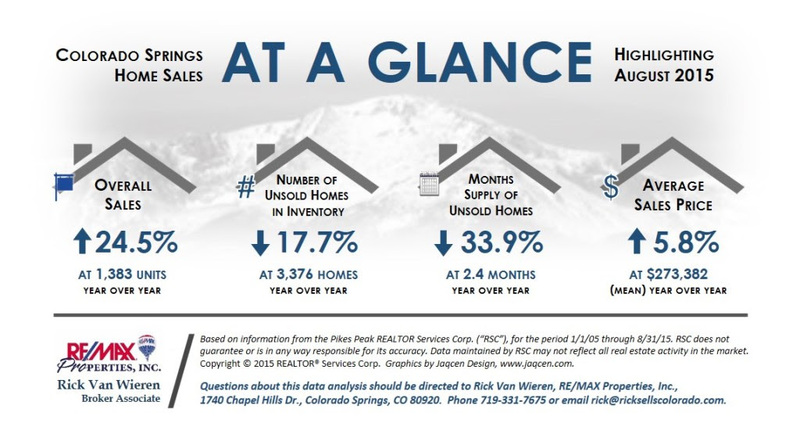 “Based on information from the Pikes Peak REALTOR Services Corp. (“RSC”), for the period 1/1/05 through 8/31/15. RSC does not guarantee or is in any way responsible for its accuracy. Data maintained by RSC may not reflect all real estate activity in the market.” Copyright © 2015 REALTOR® Services Corp.